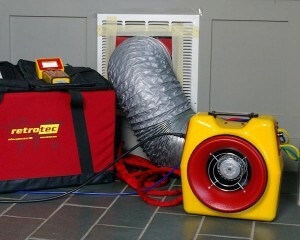 GreenEdge has the equipment to test a homes duct work to see how leaky it is. This service is offered as a Consulting Service or it can be added to any of our full audit services for a reduced fee. Call 616-419-8558. The Retro-Tec Duct Tester is a tool that allows GreenEdge to test and measure total duct leakage. Most homes have significant duct leakage, which has a dramatic effect on the comfort of your home along with the longevity and efficiency of your HVAC equipment. Leaks in duct work for heating/cooling systems are huge energy wasters. Leaks involving 20% of the total air flow will cause a 50% drop in efficiency. Up to 30% of the energy used to heat/cool a building can be lost through leaky ducts and poor duct design. We proudly serve Grand Rapids, Holland, Zeeland, Caledonia, Byron Center, Grandville, Rockford, Ada, Kentwood and Grand Haven in West Michigan. This would include but not limited to Kent, Ottawa, Allegan and Muskegon Counties.